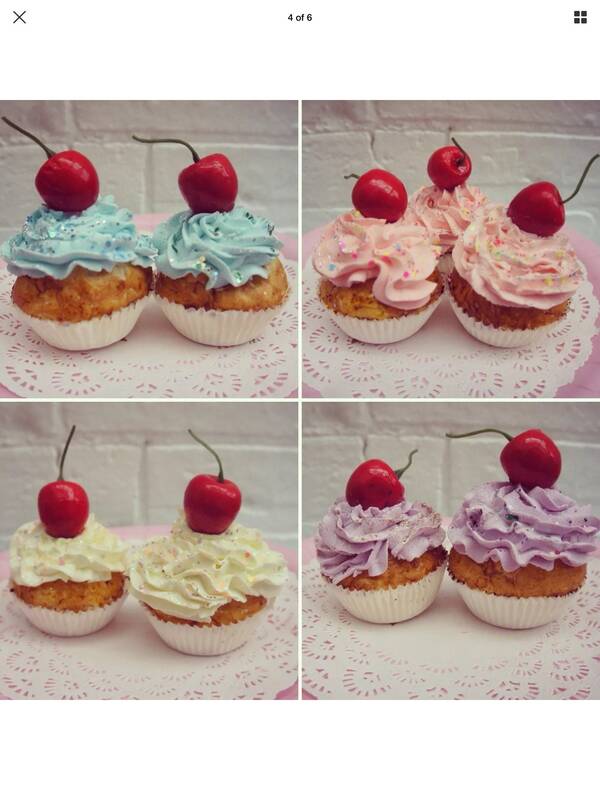 These cupcakes look sooo yummy, they are so realistic, everyone will want to eat them. But they're not real. They have been handmade by myself out of DIY products, fake cherries, fake iceing and fake edible glitter. They can be handled and posted without fear of getting covered in fresh cream. They would look amazing on display in your home all year round or for a special occasion. Some of these cakes also have split pins underneath so that they can be added to an Aliceband or fascinator to wear as part of a costume, simply twist wire around an aliceband of add to your favourite fascinator headpiece. A birthday candle or other decorations can also be added by simply pushing them in into the foamy icing on the cake. Please request which colours you would like, and weather you would like a split pin underneath. Price is per cupcake, I have aprox 15 in stock of various colours and styles. Get in touch with what you would like to order. They would also be perfect for TV film or theatre props. They may look delicious but they are not safe to eat so should be kept out of reach of small children.